Worldmark By Trendwest | Cary Kopczynski & Company, Inc. 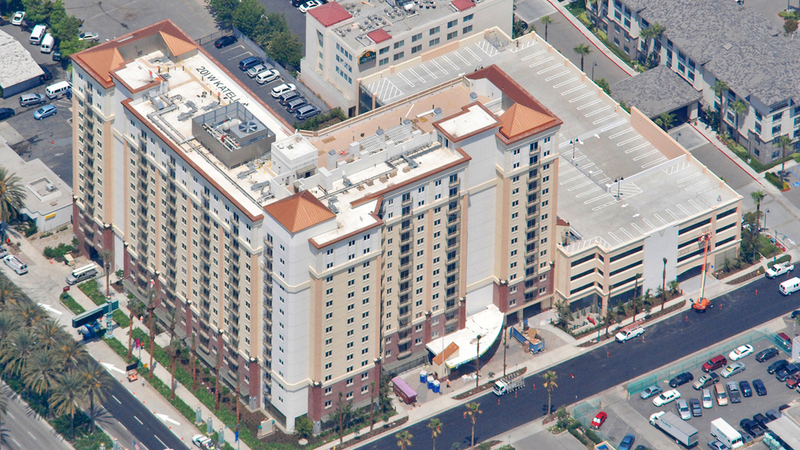 The WorldMark by Trendwest in Anaheim is a 14-story time-share condominium tower. Encompassing 316,000 square feet, the tower is complemented by a 127,000 square foot, five-story parking structure. Both structures incorporate cast-in-place, post-tensioned concrete and a shear wall seismic system. Shear walls for the parking structure are supplemented by ductile frames. The foundation system was a significant design challenge and major value engineering target. The soft native soils initially indicated that deep caissons would be required. CKC worked closely with the geotechnical engineer to develop a more cost-effective alternate. Using a computerized soil/structure interaction analysis, CKC showed that the structure could be built on a floating mat, which was ultimately selected as the final design solution.